It's been nearly three years since the three-row Tribeca died. What took so long? One year after the Viziv-7 Concept premiered at this same venue, the production-ready Subaru Ascent three-row crossover will make its official debut next month at the Los Angeles Auto Show. Subaru has just kicked off its premiere campaign on its Twitter page with a single teaser image, but based on the Ascent Concept, shown at New York last April, we have a fairly good idea what the crossover will look like. The Ascent Concept was an update to the Viziv-7, to give you the evolutionary background. But take a look at the Ascent Concept, tone down its styling inside and out and, more or less, you’ve got the production version. Subaru could really use a new three-row crossover at this point, considering the competition and high segment demand. 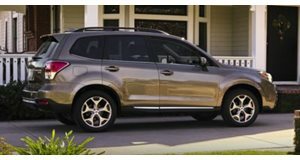 Aside from the Outback and Crosstrek, the only other Subaru crossover is the compact Forester. Subaru’s previous three-row crossover was the Tribeca, discontinued back in 2014. The Tribeca didn’t meet expectations and its optional third-row was a tight squeeze even for kids. Based on the Ascent Concept, the styling will be much more rugged looking than the Tribeca’s soft lines, which is a welcomed change. Subaru says the Ascent will come powered by a new turbocharged 2.4-liter flat-four with direct injection, but its output and all other mechanical details are being kept secret for now. We’ll have our answers in a few weeks’ time.